Burning Man in the Marvel Future is kind of weird. 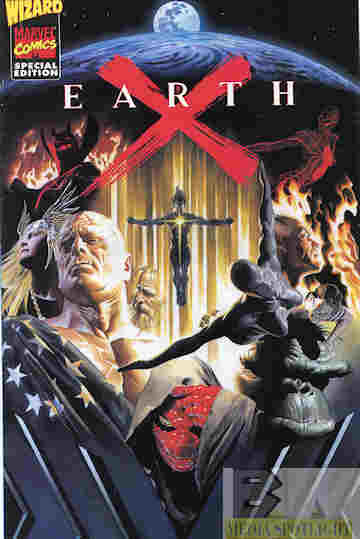 When I said Earth X was Marvel’s version of DC’s Kingdom Come this preview doesn’t deny it. The idea came in an interview with Ross about how the DC heroes could have evolved into what they were for Kingdom Come, and someone at Marvel got the idea to let him play that game with their characters. Once his schedule cleared up, Ross was willing to do it. This isn’t a comic, but it does explain the world and concept used for the miniseries. So I’m really just reviewing the concept presented since I never picked up the miniseries itself. I like the general idea. A plague called Plague X turns most of the world into mutants. One mutant is a boy with the power of mind control and starts his own Reich, calling himself Skull. Superheroes have become obsolete but Captain America is still trying to fight the Skull and his forces as they try to take over the world. Reed Richards, dealing with the death of Sue Storm and blaming one of his experiments for Plague X, has become the new Doctor Doom and lives in seclusion. Another result of the experiment is Iron Maiden, although she’s actually coated in vibranium, while Iron Man has formed a robot team to avenge the Avengers called the Iron Avengers. Spider-Man has retired since he doesn’t feel the responsibility when everyone has great powers and is dealing with Mary Jane’s death, but his daughter May has become the new Venom after it used up Eddie. The Inhumans decided to join the outside world and the royalty left, but now have returned and hope to recollect their people. Ben Grimm has formed his own Fantastic Four since Alicia’s powers allowed them to have kids, the “Brothers Grimm”, and she’s created clay Avengers resembling the Avengers of old. Franklin Richards went missing but not before curing Namor for killing Johnny Storm. The X-Men still fight evil mutants but human/mutant relations are hardly an issue anymore. Loki tricked Odin into making Thor into a woman, which may end up being bad for Loki’s ego. Norin Radd is still the Silver Surfer but for whatever reason Galactus turned his long-lost love Shalla-Bal into a Silver Surfer as well. And the original Captain Marvel of the Marvel Universe, Mar-Vell, may be returning from the dead. That’s a lot to take in but I have the same problem with this that I did with Kingdom Come, and it’s admittedly a personal preference rather than a problem from a critical perspective. It’s just a very dark sounding future, moreso than the story that inspired the concept. Everyone has superpowers but the world is still miserable. The Marvel heroes can’t simply retire in peace so the world is falling apart and they have to opt to save it despite living in a world where not having powers is rare. I don’t read stories to be depressed but seeing what happens to my favorite heroes like Spider-Man and Iron Man doesn’t work for me. I do like the idea of Bruce being split from the Hulk as an eternal 10-year-old given Ross’s reasoning. Of course, this is the guy who covered the Phantom in berry juice and I still find that reasoning flawed. The character designs are pretty cool, my favorite being May’s Venom form. This shouldn’t be a surprise as Ross is a fantastic artist, even if I don’t care for the painted style as sequential art. I do wonder why the Skull is wearing the Punisher’s skull design when he’s clearly a new version of the Red Skull, the last Nazi-style fascist Captain America went up against (not counting that Secret Empire disaster). If all of that sounded interesting to you, then by all means track this down. It’s just not what I’m looking for. Posted by ShadowWing Tronix on September 19, 2017 in Marvel Spotlight, Yesterday's Comics and tagged Alex Ross, Captain America, Earth X, Fantastic Four, Iron Man, Kingdom Come, Marvel Comics, Mutants, Spider-Man, X-Men.